Article by Doug Chaltry; last updated 19 March 2016. The Vertical Volute Spring Suspension (VVSS) was the standard suspension seen on most Shermans and Sherman variants throughout the war. Late in the war, the Horizontal Volute Spring Suspension (HVSS) was introduced in an effort to improve the performance of the Sherman on soft ground, but it appeared only in small numbers, and the vast majority of Shermans mounted the VVSS through to the end of the war. There were several variations to the VVSS, in terms of changes to the return roller arms, the track skids, the wheels, and of course, the tracks. Most plastic model manufacturers are seemingly oblivious to these variations. It has taken the resin aftermarket industry several years to catch up with this product opportunity, and today we have several choices for replacement wheels and tracks for our Sherman kits, though we are still lacking variety in the bogie suspension units themselves. Resin replacement parts have been showing up piecemeal since the early 2000s with companies such as Caliber72, MR Models and Armory giving us a few choices in wheels and tracks, but the real breakthrough came in 2015 thanks to the extraordinary examples of fine resin casting by OKB Grigorov. Since their initial release of the WE210 track, which was virtually unknown at the time, this company has released every style of roadwheel, idler wheel and sprocket wheel that were seen on Sherman tanks during and after World War II. They have also done every track style (both VVSS and HVSS), some of which were fairly uncommon, and many with several different designs of extended end connectors. The extremely high quality and detail of the resin casting on these parts need to be seen to be believed. I am hopeful that in the coming years OKB Grigorov will also provide the modeling community with replacement bogie suspension units as well. Below, presented in five separate tables, I've provided comparison scans of most of the suspension parts that are available to model builders. One thing to keep in mind is this: these scans considerably magnify the real items thereby making differences between the parts stand out. This is good if you're a real rivet counter, and tenths of a millimeter are important to you. But I think the most important thing is how these parts look on the final model. When they are shown side by side as on this page, the return roller, for example, on one kit may look huge when compared to that on another kit, yet when seen on a built model, will it really be noticable? Just something to think about. I have seen the suspension parts referred to in several different ways in different sources. Some refer to them as "suspension units", "bogie units", "suspension or bogie trucks", or simply, "bogies". I'm not entirely consistent in the way I refer to them either. These units are composed of several parts that are often referred to separately. The main piece that holds it all together, with the vertical ridges molded on the front is the suspension bracket. We also have the return roller and return roller arms, track return skids, the volute springs (barely visible inside the bracket), and the suspension arms and levers. The part with the most variation is the return roller arm, which could be mounted horizontally, or with an upward angle. On some horizontal arms, the wheel mount was elevated on a small pad. There were also three shapes to the return roller skids, but the one seen below by far the most common one that saw service during the war (except for some in North Africa on some very early British Shermans). Dragon Very nicely detailed; probably the best of the group. Road wheels are molded to rear suspension arms. Horizontal return roller arm with raised wheel. Extratech/Eduard Partial articulation of the wheel suspension arms is possible. Track return skid molded solid. No support braces molded onto return roller arm. No gap between suspension arms and levers. Upraised return roller arm. Heller Detail is a little soft on the gudgeon bolts, but otherwise extremently nice. Horizontal return roller arm with raised wheel. Italeri Standing a little tall. No support braces molded onto return roller arm. Horizontal return roller arm with raised wheel. Mirage Currently only early style bogie available, only in the Mirage M3 Medium Tank series. Excellent detail. Revell Very thick track return skid. Soft detail. Horizontal return roller arm. Trumpeter Horizontal return roller arm. No support braces molded onto suspension levers and arms. Return roller a little large. UM Moderately nice detail. Mostly-horizontal return roller arm. Return roller drilled off-center. Etched brass track skid. One thing that stands out to me when looking at these scans is the overall lack of variety in these parts. Only one kit, the Extratech/Eduard kit, has the upraised return roller arm, and even that one is questionable, and could actually represent the horizontal arm as well, depending on how it's glued. Given the molding quality of the Dragon part, that's the company that I would hope would give us different variations of the bogies, but they seem utterly uninterested in doing so. I was a little surprised when I looked at these parts in the side-by-side scans. I now have a much greater appreciation for the bogie from Extratech/Eduard, which I used to consider to be substandard. It certainly could use some help in areas lacking detail, but when I looked at the parts in the box, I thought it was going to look very large and blocky when built, but as you can see, that isn't the case. While it lacks the detail and molding finesse of the Dragon bogie, it looks decent and in no way needs replacing. The Dragon bogie looks the best of this bunch, as long as you buy a recent kit release with the revised parts (early releases had flawed bogies; see the M4A1 Normandy preview). The Trumpeter bogie would have been an excellent piece, except for the lack of support ribs molded onto the suspension arms. Mirage is the only company giving us the early style bogie with the return roller on the top of the suspension bracket. I guess this isn't surprising since this bogie was seen on only the earliest Shermans in North Africa, none of which have yet been released by any company. Modelltrans offers this early bogie as a resin conversion set, which I believe is based on the Mirage parts. Also notice the track return skids. I think the Trumpeter skid looks the best, with Dragon and even the old Italeri (ESCI) parts looking decent as well. But none of these compare well to skids made from etched metal. The only kits that include etched metal parts are the Profipack versions from Eduard, which I believe are discontinued, and UM's newest M4A1 kit. You can find these skids in several aftermarket detail sets, and I recommend to any manufacturer debating producing new detail sets to be sure and include them. 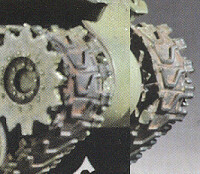 All of the sprocket wheels shown below are almost exactly the same (correct) size: approximately 9.5mm diameter. Even the Revell piece is correct for this scale (probably the only part in that kit that is). We have five choices of sprocket styles here: the "standard" sprocket, which is designated by its part number D47366, and three variations of that piece, as well as the sprocket for the Canadian Dry Pin (CDP) track. I have shown the examples from OKB Grigorov in the top row, as they are the finest examples of these parts available, and all others should be compared to them. Even though you can see variation in quality and detail in all the examples below, the only one that is truly bad is the Italeri (ESCI) piece, which has one too few sprocket teeth. Manufacturer D47366 D47366 Economy D47366A Cast D47366B Forged C.D.P. There are three primary styles of idler wheel: open-spoked and stamped spoke, both of which were fairly common, and a solid, heavy-duty idler, which was introduced towards the end of the war and was common post-war. Only OKB gives us this wheel style. OKB also gives us a fourth variety, which was seen on some post-war French Shermans. I have seen only a single photograph of a museum piece that has this wheel, so it was very uncommon. As of this writing, the only decent open-spoke idlers are from OKB, Heller, Trumpeter and Mirage, whereas several companies make good stamped wheels. The Italeri wheel is a bit strange. It is a solid wheel, yet the spokes are very deep and prominent, sort of a hybrid between stamped and open-spoke wheels. The UM idler is the opposite, with very shallow detail and the rim cast off-center of the wheel diameter. The OKB wheel is the best, but the Dragon, Heller, Trumpeter and Mirage wheels are very good too. The correct diameter of these wheels should be just under 7.8mm, and with the exception of the huge Revell wheel (almost 9mm), all the others are within a hair of being correct in size. We have six varieties of road wheel avialable to us in this scale, some of which were more common than others on wartime tanks. The two wheels on the left, the stamped spoke and open spoke varieties, were the most common wheels seen in wartime photos, and likewise are the most common in the plastic kits we have available to us. The third style, the TB ORD 22, was essentially the open spoke wheels with metal plates welded over the spoke openings to prevent enemies from sticking metal bars through them. It is infrequently encountered in photos. The last three are "high-capacity" wheels developed for heavier vehicles, such as the Jumbo Sherman (particularly the closed spoke wheel), as well as replacement wheels for 76mm Shermans, because they were heavier. These wheels should have a diameter of 7.05mm in 1/72nd scale. With the exception of the MR wheels and the huge Revell wheels, all the others are very close to perfect. These wheels should have a diameter of 7.05mm in 1/72nd scale, and most of the wheels shown here measure very close to that. There are a few exceptions, and in fact, I was suprised to see how bad most of the MR Models wheels look compared to the others. The Shermans by MR are such gorgeous models, I guess I just assumed that their wheels were nice too, without ever looking very closely at them before now. They market two varieties each of the open-spoke and stamped wheels, one of each of which is really poor. I wonder if the second variety represents an attempt to improve upon the earlier wheels. Once again, the wheels by OKB Grigorov are the best ones available. Many of the others are very good as well, but there are also many that are not. The Revell wheel and the early MR Models wheels are simply too large to use (plus the early MR stamped wheel has an incorrect number of spokes). Even the improved MR stamped wheel is a bit larger than the others seen here. As with their idler wheel, the Italeri road wheel has very deep and pronounced spokes, almost as though it was an open-spoke wheel, but there are no openings between the spokes. The best open-spoke wheels are from Calibre72, Heller, Trumpeter and Mirage. The spokes of the Eduard wheel look decent, but this wheel is far too thick, by about 25%. It's probable that we could sand the rear of the wheels to make them thinner, as nobody will see the backs anyway, but the bogie trucks also may need to be modified to accept the narrower wheels. The UM spoked wheel is bad for many reasons, such as being molded off-center and with an extra spoke. UM's stamped wheel is a little better, but with very shallow detail and the center hole drilled off-center. There are several other very good stamped wheels, including those by Calibre72, Dragon, Heller and Trumpeter. Even the Extratech wheel is decent. Aside from OKB, only four other companies make the solid dish wheel: Trumpeter and Dragon in plastic, and Armory and MR Models in resin or white metal with two of their conversion kits. I've not seen the MR Models wheels in hand, so I cannot comment on them. The Trumpeter and Dragon wheels are really quite good. These problems can best be avoided by using hard plastic (or metal or resin) link and length tracks. I've made it no secret in all of my kit reviews that I normally detest soft plastic tracks. But as I've also mentioned in my reviews of the several Dragon Sherman kits, I think that the tracks made in Dragon's DS100 material don't appear to suffer from these same problems due to the nature of the Sherman VVSS tracks. The tracks for the VVS suspension are very thick, and if they are molded properly, as Dragon has done, then these single piece, "rubberband" tracks are likely the best way to reproduce Sherman tracks in this scale. T48 T49 T51 T54E1 T54E2 T56 T62 T74 WE210 C.D.P. So, what do we see here? The most common tracks available to us are the T48 rubber chevron and the T54E1 steel chevron varieties, which I also think were the most common versions of track seen on American Shermans. The British frequently used those as well, in addition to the WE210 and T41 in North Africa, and the T49, T54E2 and T62 tracks in Europe. The T49 was also commonly used in the South Pacific by both the US Army and US Marines. The T74 was a rare style, though in photos it is probably easily confused with the other chevron tracks. The T56 shown above from OKB is problematic; it is shown in the Army manuals for the Sherman, but according to some references, it was never cleared for production. If it was used, it is probably difficult to distinguish in photos from the T49. We have a wide range of quality between the manufacturers, with the best examples of all the tracks coming from Dragon. The resin tracks from OKB are by far the best detailed and molded. However, they are about 0.7mm too wide. This certainly does not seem significant, but it may cause problems mounting on kits where their suspension units are designed for narrower tracks. I think that the Italeri release of the old ESCI M4A1 Sherman includes both the soft plastic and hard plastic versions of the T48 track. Also, later versions of the ESCI kit, depending on which company boxed it, may also include both, or only the hard plastic versions. In this table, I have shown the soft plastic track under ESCI, and the hard plastic track under Italeri only for convenience. The Revell track has an odd shape to its chevrons, and could theoretically represent either the rubber or steel chevrons, though I placed it under the T48 column because I think it's closest to that style. That track is also a little bit wider than the others as well, and may not fit on most accurately-sized kits. The Trumpeter tracks have nice detail, but they are so thin and flexible that it will be almost impossible to make them look good. My compliments to anyone who is able to do so. Mirage makes two basic tracks, the plain rubber block T51 style included in their M3 Medium Tank series kits, and the T48 rubber chevron sold as an aftermarket set. They also market several other track variants that are simply the T51 tracks with photoetched parts to be glued onto the face of each rubber block link to provide the surface detail for the specific track style. I've not seen any of these built yet, but I suspect that the detail will be too flat. The chevrons on their T48 track have sunken a bit when the rubber was curing, leaving unsightly sinkmarks in the center of each chevron. The UM tracks tread that middle ground between most closely resembling the T48 or T54E1 chevron tracks. I think they are closest to the rubber chevron variety, so I put them in that column. These tracks are also considerably narrower than all the others in this review. It is unfortunate that the UM tracks have these errors, because being cast in link-and-length, hard plastic is now a wasted opportunity. For aftermarket tracks, the Fine Scale Factory winter tracks are simply copies of the ESCI track with extended end connectors added to them. The resin tracks from MR Models are fairly decent, though not remarkable. Their T54E1 tracks have very flattened chevrons, and are overall disappointing. ModellTrans makes a set of T54E2 tracks with extended end connectors. I assume they chose this stye because of the very nice Extratech tracks to use as a base.